There is the vacant house which has formed local community. “House of Komajii” in Komagome of Tokyo opened as a place where local people stay in October, 2013. 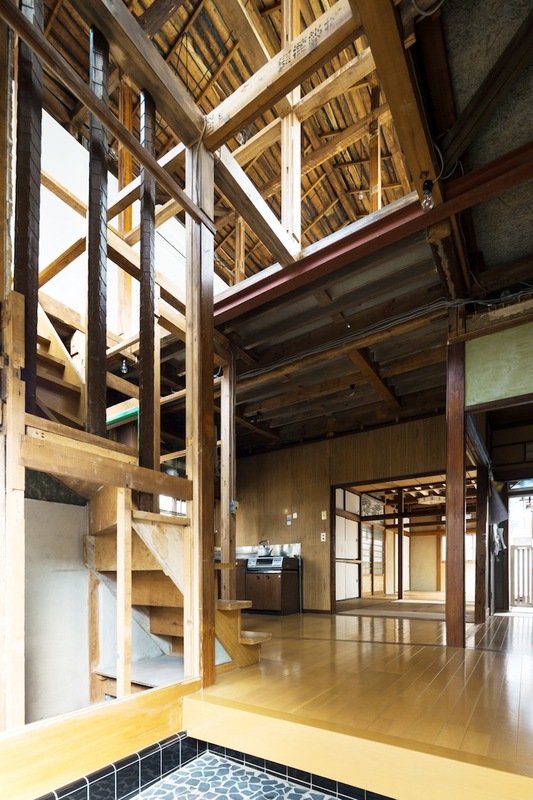 Because originally this vacant house was a dormitory, the space was divided finely. Therefore about half of the building was a storeroom. When I received the request of the design, The client expected that I released the space of the storeroom in the area, and made the structure for “House of Komajii” to become independent, and rotate. (It is run now without almost taking the fee for use by the kindness of the owner.) I plan to break a wall and enlarge the space, and more people can gather in the first floor and convert the second floor to share office as source of profits. I visited the building several times before beginning design. The state of the building was bad and the outdoor stairs got rusty and died, and the finish of the inner wall had come off. But many people gathered in such the building for some reason. It is the place that everybody can spend from a neighboring child to the elderly freely. It sometimes overflows with a person so that there’s no place to stand in. The community has formed spontaneously by the owner releasing the vacant house in the area. I think the scene like that the community was formed by people gathering for TV in old times when there was only one TV in the town is near that. It is not the “made” public that the government provides administratively, but the new public by “self-build” of citizen. I collected all the expenses of the renovation from a local user. In addition, I had local people participate in DIY, and the thought of the individual has been left to the building. And I gave priority to that I enlarged the space without spending money. Therefore the things of the different character are simultaneous in one space, for example the violent space that I only dismantled, the Japanese-style room which was just left, newly finished white wall, the old fixtures which I transferred and reused, the pillar that the heights of children were carved , the switchplate which a neighboring foreign student made with cardboard, the signboard which grandfather of the owner handcrafted, and ranma which an old craftsman made. I mix such different things without order and aim at letting them exist in a natural state. I design the architecture which does not make “made” feeling by accumulation of the “self-build” of many people.